AC plug: US, UK, EU, India, AU etc. Output connector type: XLR, Anderson, Clips, RCA etc. This 48V 5A smart battery charger is designed for 48V lithium battery powered electric mobility, bike and scooters. It can charge 48V LiFePO4, Li-ion, LiMnO2 types batteries. Smart charging with Pre-charge, CC, CV and floating or automatic cut-off method. With max 54.6 / 58.4 Volt 5 Amps fast charging and multi-protections. VLDL Smart Battery Charger is a fully automatic 4 steps charging with Pre-charge, CC, CV and Floating/shut-off intelligent battery charger. Charging faster and accurately than conventional big and heavy chargers. The pre-charge step can active your low voltage battery and protect your extremely discharged batteries. After pre-charging, CC step will charge with Constant Current with very fast speed to reach battery’s max voltage. Then CV step can charge with Constant Voltage, the charging current begins to drop at this step. At last, Floating step charges with very small current when charger detects battery’s capacity was charged almost fully. The float charge or called trickle charge holds battery at 100% ready state and charger can be left on without worry of undercharge or overcharge.Or if your battery is lithium battery type, our charger can set to be shut off when battery is fully charged. VLDL chargers have worldwide input voltage 110-240Vac, some models was designed with PFC circuit. Charger automatically operates on voltage of 110Vac or 240Vac when user connects it to the local wall socket. We customize input plug and output connector types by customer’s request and meet local applications fully. 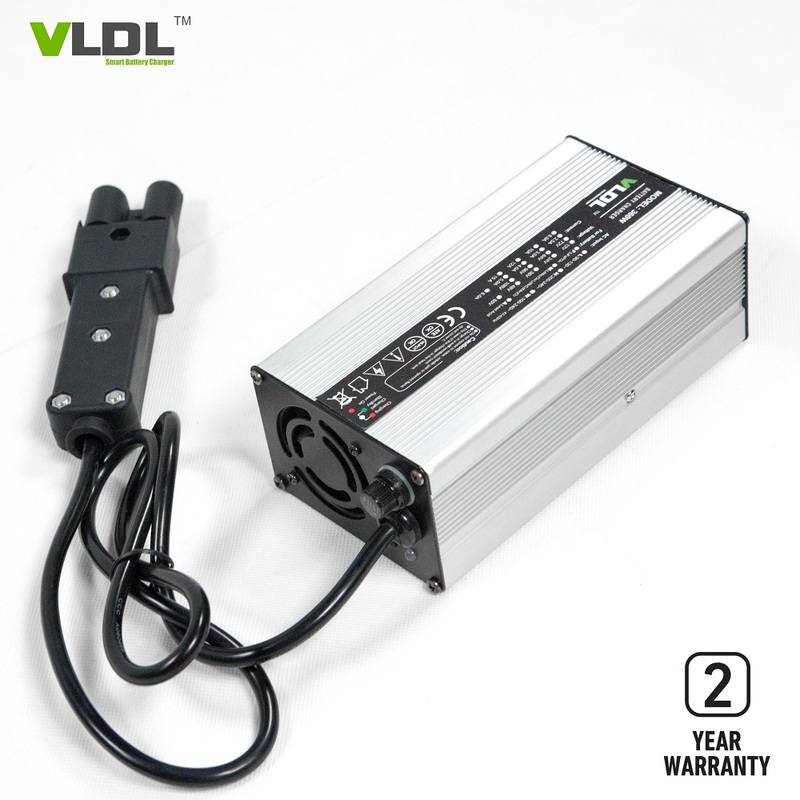 VLDL smart battery chargers are widely applied to electric vehicles including e-bikes, e-scooters, e-mobility, e-skateboards, e-motorcycles, e-golf carts, electric floor sweepers etc., whatever battery types your electric vehicles powered by, lithium(LiFePO4, Li-ion, LiMo2, Li-polymer etc.) or lead acid (AGM, SLA, GEL, Flooded, Deep cycles etc. ), our charger can charge it with high speed and intelligent method. 1) Optional charging methods: LiFePO4, Li-ion, LiMo2, AGM, GEL, Flooded. 2) Advanced high frequency switching mode power supply technology. 3) DC output isolated from AC input. 4) Automatic worldwide Input 110/230Vac(90~264Vac), 50Hz~60Hz. 5) Charging parameters are insensitive to the AC input line voltage variations. 6) Completely automatic 4 steps charge: pre-charge, CC, CV, floating/trickle or shut-off. 7) Protections: Short circuit, Over-voltage, Over-temperature, Reverse Polarity. 8) Aluminum casing, light weight, portable. 9) 100% full load burn-in test. DANL New Energy is a 15 years battery chargers manufacturer/factory/supplier. We design and manufacture all by ourselves. We control the quality with high level and have been updating our technology to the latest. We promise 2 years full warranty for all of our battery chargers. Best quality and factory price are worth to be your sincere supplier of battery charger market.